The PPS62 Pressure & External RTD Gauge combines a piezo sensor with a highly accurate RTD probe to allow users to obtain fast pressure and temperature responses. 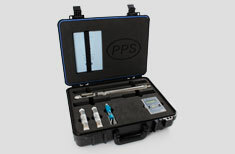 This product is primarily designed for detecting tubing and casing leakage problems. The gauge can be run in tandem with a depth measurement system, such as the PPS36 DepthWatcher which will enable the user to record line tension, speed and depth inconjunction with downhole data from the gauge.